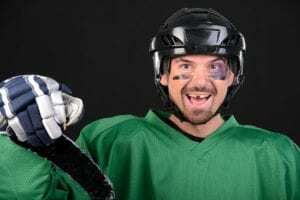 I was at a hockey game and saw one of the young men lose a tooth. I always heard the mothers joking about needing a good dental plan if your son joins the team. It got me wondering. Can those teeth be saved or do they have to get replacements for all the teeth they have knocked out? Call your dentist and let the office know what happened. It’s important you get treatment within 30 minutes. If they know you’re coming, they’ll be prepared for you when you get there and can start treatment right away. If you don’t have a dentist, then you need to call an emergency dentist. They’ll see non-established patients in cases such as this. Never touch the root of the tooth. THat could damage it. Instead, hold it by the crown (the visible part of your tooth). It’s very important the tooth be kept moist. If you have access to a glass of milk, you can place the tooth there. If that’s unavailable, then you can place the tooth gently between your cheek and gums. This should keep it moist enough. Following these simple tips will help keep your smile bright and healthy for your lifetime. A tooth being knocked out isn’t the only reason you’d need an emergency dental appointment. The most common reason is pain. This is your body’s way of warning you there’s an infection somewhere. Dental infections can’t just be dealt with by using a simple antibiotic. Your dentist has to get in there and physically remove the infected pulp. This requires a root canal treatment. Another common issue is a broken or cracked tooth. Your dentist will place a dental crown over the damaged tooth in order to protect it. It’s always best to know those things in order to be prepared ahead of time.